Exercise is important during pregnancy but you need to know what to do and what not to during pregnancy. Find all about the don'ts during pregnancy here. Are you preparing for a healthy pregnancy? In that case you must have definitely heard about the benefits of exercises during pregnancy. It gives you better sleep, more strength and endurance and a much lighter mood, say doctors. Experts have said that swimming and walking are great exercises during pregnancy. However, there are certain exercises which you need to avoid during pregnancy as they may not be too safe for you and your baby. Here is a list of those exercises you need to avoid for a safe and healthy pregnancy. Weight loss exercise: Do not try to do any weight loss exercise during pregnancy. It is essential for you to gain 25 to 35 pounds of weight during this period depending on your pre-pregnancy weight as weight gain is a sign of your baby’s healthy development say doctors. Contact sports: You will have to avoid all sorts of rough-and-tumble sports like soccer, basketball and ice hockey as these may put you at a greater risk of getting knocked in the stomach. Hence, doctors suggest avoiding such sports after first trimester once your belly starts growing. Fall-prone activities: It is a must that you strictly avoid activities that need a lot of balance like skiing and horseback riding. Even riding bikes outdoor is pretty risky as you are not used to balancing a pregnant belly. You need to talk to your doctor if you got to ride a bike for transportation and know how to keep you and your baby safe. 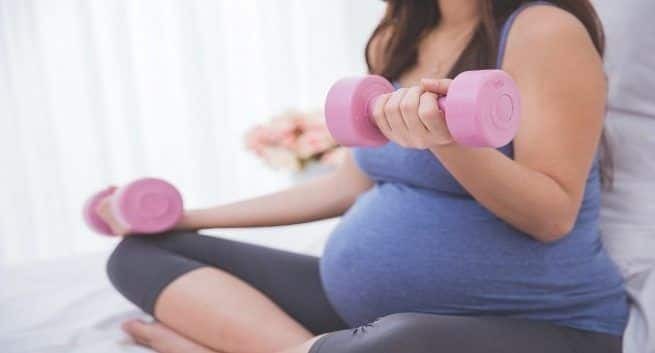 Overdoing it: Pushing yourself to the point of exhaustion may boost athletic performance but it is a no-no during pregnancy as it can lower blood flow to your uterus and affect your baby in the womb.